HÀ NỘI — V.League champions Quảng Nam FC are faced with the possibility of not qualifying for the Asian Football Confederation (AFC) Champions League 2018. One of AFC’s rules is that any team that wants to take part in a continental competition has to compete in all official national youth tournaments. Quảng Nam have participated in all events except the U17 tourney. Speaking with reporters, coach Hoàng Văn Phúc said his players were excited to take part in the AFC tournament for the first time, a result of their efforts over several seasons. Executive director Nguyễn Húp said Quảng Nam’s managers would work together to resolve the issue. 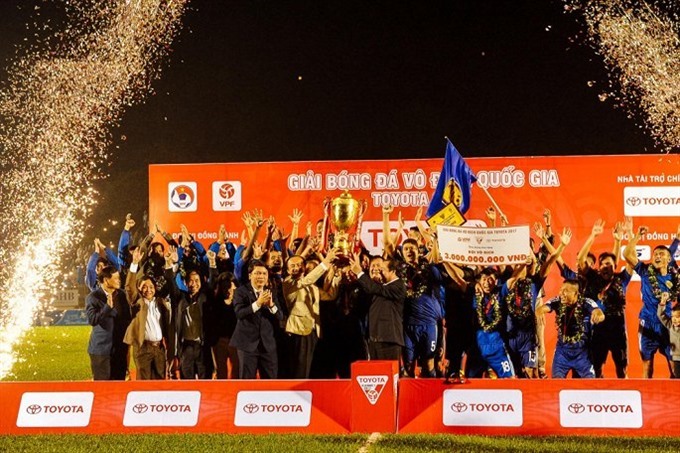 Quảng Nam Province has only recently begun to focus on the development of football development. Training activities, however, did not produce great result leading to their absence from the U17 competition. Quảng Nam received strong support from provincial leaders and sponsors to compete at the AFC event. The club said they would try their best to make this dream come true. At present, only five clubs in Việt Nam – Hà Nội, Sông Lam Nghệ An, SHB Đà Nẵng, Quảng Ninh Coal and FLC Thanh Hóa – can meet AFC’s demand.